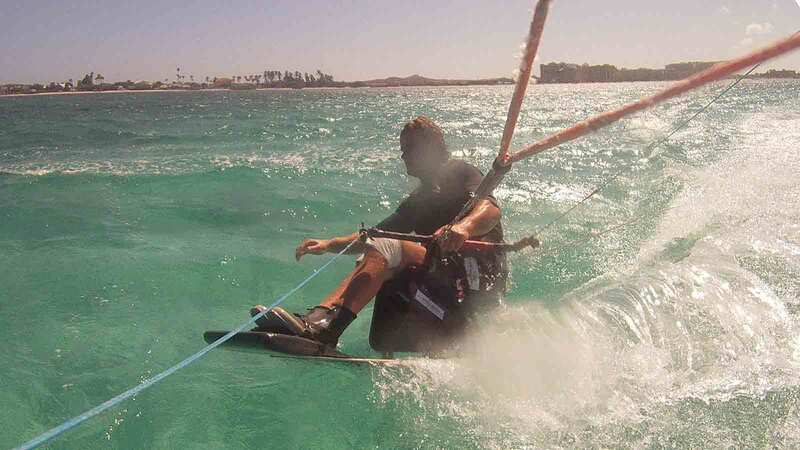 Winter 2009, I am surfing on the net and I discover that there are a few guys trying to kite surf seated. 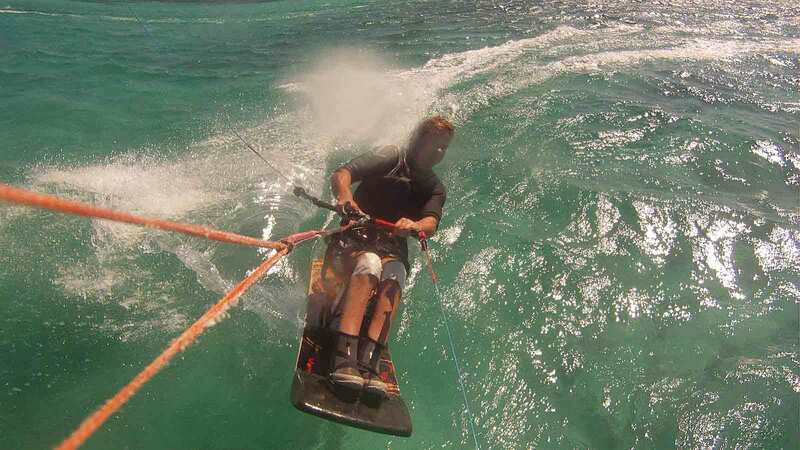 I always thought it would be possible with my paraplegia to wake board behind a kite. And since the introduction of the bow type kite with a lot of de-power, I was sure there should be some guys doing it seated on the planet. Unfortunately, I had to park the idea due to my Paralympic campaign in the 2.4mR. The professionalization of disabled sailing at Paralympic level in the Netherlands was such that there was no time for other exotic activities like kitesurfing seated on a wake board. The day after winning my bronze medal at the Games in Weymouth, I contacted those few guys in France to ask if I could come along trying there prototypes. The first one, Christophe Martin, seated kite boarder and in a wheelchair like me was not really answering my emails. He was very busy organising kiting courses on a catamaran for disabled people, the so-called Catakite. Nevertheless, his achievement on his “handikite” was a great source of inspiration. The second one, Tadeg Normand, kitesurf instructor and designer of the Seatkite, reacted enthusiast but did not really want to share his knowledge for free. He was afraid I would steal his idea and went away with it. Nevertheless he accepted to let me try his Seatkite prototype in a three days session at his place in Brittany in December. This session enabled me to experience everything that could go wrong in trying to kite strapped on a board. Especially the static stability of the Seatkite with the kite in the water pulling me horizontally through the water is very important for the security. The position of the “towing point”, understand the position of the harness hook, and the distribution of the volumes and weights are critical. With this in mind I went to Bram, race board shaper, to share my plans and gained knowledge. He was very enthusiast about the whole idea. He had very quickly a prototype ready. It was so simple that we could launch it from the beach. The only problem is that it was winter in the Netherlands. We would have to wait until spring to try it in the water. As I also needed to learn controlling the kite, I would spend a lot of time in the water, not really an attractive idea, when the water is not warmer than 5 to 6 C, brrrr. Through my wife, Diana, journalist and owner of a sailing news website (www.sailreport.nl), I got in contact with Francis and Rob in Aruba. They have a few catamarans and know some guys on the island that could assist in my project “help Thierry a.s.a.p. kiting :-)” . Wim from Aruba-Active-Vacations was also directly enthusiast in trying to help wherever he could. After a few email exchanges to sort out what kind of help I would need, it was not difficult to convince Bram to book a flight to Aruba for a 10 days seated kiteboarding training/learning holiday. We were not yet on the island, but we got the support of so many friends from Rob and Francis: Rob borrowed us his pick-up truck, Henk and Debbie from Paradera park made possible to stay at there place; thanks for the wonderful coffee every morning ;-) And Wim assured me that for the security he would have a small rescue boat standby at his kiteboarding school. The guys from Vliegerop in The Hague are developing the kites for the brand Peter Lynn. They borrowed us some kites for our stay in Aruba; many many thanks! And last but not least, Annabel van Westerop, pro-kiter, spontaneously proposed her assistance for any advises I would need. The picture of her seating on my board and shared on Facebook and Sailing Anarchy received so many positive reactions from the kiting and sailing community Worldwide. I’m impressed. The pictures taken during our stay illustrate the rest of the story. Frank, kitesurf instructor and professional photographer made really nice action pictures. We were able to kite every day, we used only one kite, 11m2. During the first 5 days, we tried different seat positions and heights on the board. We also experimented with different fin sizes. In the mean time I started to understand the handling of the kite, so different from sailing. And at the end of our stay I was able to kite forth and back in front of the kiteschool without loosing to much height, meaning that I could do sessions of 1-1,5 hours without any “pick-up” from the rescue boat. And all the kiteboarding instructors from Aruba-Active-Vacations were very impressive. They helped, in between their lessons, with everything I needed: pumping my kite, carrying me from the car over the beach to my board, pick me up with their rescue boat when I drifted to far away from the shore, carrying me again from the rescue boat to the shower, re-pumping my kite for another session, etc etc. They always did it with a big smile and a lot of recognition; with so much “natural” and spontaneous help, I didn’t feel my disability for 10 days, so grateful, thanks guys! You are an amazing team.